Ask A Hampton Hills MARKET EXPERT! DESCRIPTION Located in a quiet cul de sac on a huge pie lot you will find this BRAND NEW 4 BEDROOM home with an enormous double garage. One bay is 27ft long and the other is 25 ft long and each has a 9ft wide door so bring your dually trucks and toys!! Once inside this nearly 2300sq/ft home, you will see it is fully loaded with a high end features such as engineered hardwood, quartz counters throughout, stainless steel appliances, gas fireplace, wainscoting below the windows and extra kitchen cabinets that go right to the 9ft knock down ceiling. This builder always adds a signature ceiling box with crown moulding above the island with pendant lighting. Upstairs you arrive at the massive bonus room centered between all 4 bedrooms. 2 or located above the garage, one adjacent to the bonus room and the large master retreat is at the rear of the residence. It offers a large walk in closet with built in shelving, a full 5pc ensuite with dual vanities, soaker jetted tub and stand alone shower. You gotta see this one! Home for sale at 722 Hampshire Cv Ne High River, Alberts T1V 0E6. 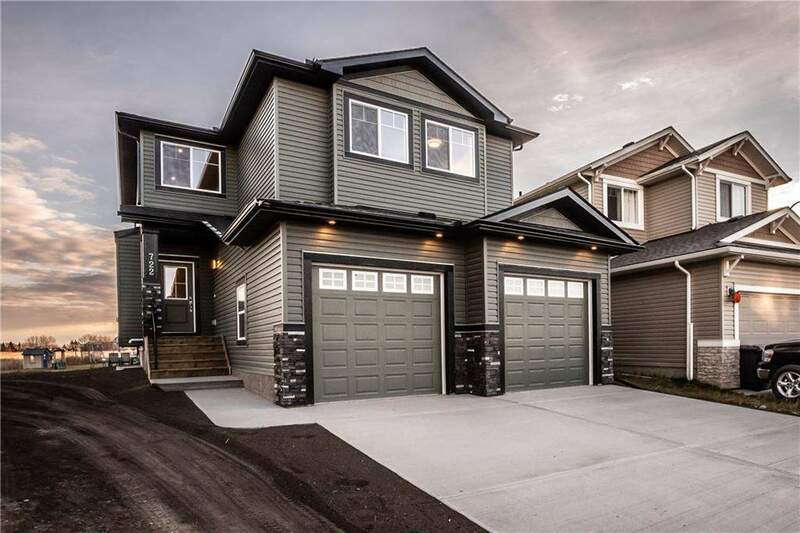 Description: The home at 722 Hampshire Cv Ne High River, Alberta T1V 0E6 with the MLS® Number C4215134 is currently listed at $459,500.